In Andes we take our maples seriously. Many folks here tap and boil for fun and family; regulars can keep their own syrup behind the counter at Woody’s Country Kitchen. My parents have been coming to Andes since the 1960s and moved here permanently about 10 years ago. It didn’t take long before the home-sugaring bug bit them and they started tapping maples, invested in an evaporator and shed. Today they have a proper wood-burning sugar shack. Even better than the sweet syrup they produce today, we also love the sap. I remember visiting Andes during the Spring as a child. I wondered why so many trees had hooded buckets hanging from their bark. Now, I know that they were collecting sap and theoretically the cap keeps the bark and bugs out of the watery extraction. In addition to the sap collected for syrup, we also collect gallons for other uses. Left to right: Simon Canales, William Haugeto, Kyle Canales, Harold Haugeto and David Haugeto drilling holes in maple trees for sap. My mother freezes the sap in ice-cube trays and saves them for the Summer and Fall. She’ll boil the sap for tea or to drink on its own. During the Spring run we’ll also use the extra we collect to make pancakes instead of using water. In fact, you can exchange maple sap for water in any recipe that would benefit from a subtle sweetness. The sky’s the limit. This year my brother, who brews his own beer with water from the Wolf Hollow cold spring, is considering using maple sap for a special brew. He’s been experimenting with great results for years. We can’t wait to give the new brew a try. If you’re interested in learning more about sap collecting or maple sugaring in New York State, you might come in March during the Maple Weekends. Maple Weekend is a chance for the public to come to the farm to learn about New York’s maple sugar making processes and traditions and to provide a chance to taste pure maple syrup in its many forms – right from the source. 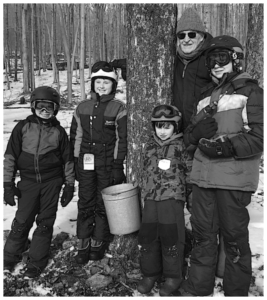 Maple Weekends for 2019 run from 10 am – 4 pm, March 24th, 25th, 30th, and. 31st.